New Zealand teachers and schools recognised as global leaders in using technology to transform learning through Microsoft’s Innovative Educator Expert Program. Fifteen Kiwi teachers who are using technology to transform education in New Zealand have been selected to join a global community of 800 education leaders as part of the Microsoft Innovative Educator (MIE) Expert Program. Each year, Microsoft selects MIE Experts who are creatively using technology to help students achieve more and succeed in an increasingly technology-based world. These teachers have incorporated technology into their teaching and want to share their experience and successes with other teachers. “The Microsoft Innovative Educator Experts are inspiring examples of how New Zealand teachers are using technology to change the way they teach, allowing them to do more and achieve more,” says Evan Blackman, Education Lead, Microsoft New Zealand. 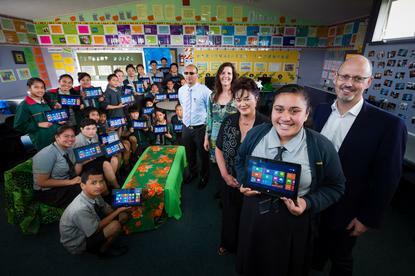 “I’m thrilled that 15 New Zealand teachers have been invited to be Microsoft Innovative Educator Experts. “The introduction of new and exciting Microsoft technologies has revolutionised the way I teach and the way my students learn in my classroom," he adds. "It has helped me to deliver lessons and content in a way that just wasn’t possible in the past and has refreshed and further ignited my passion and enthusiasm for teaching." Mann has created an online learning hub in his classroom by using the OneNote Class Notebook Creator to set up a class notebook for his students, while Clint Chalmers of Lyall Bay School in Wellington was also selected as an MIE Expert for his work in setting up a student run radio station. “I am really eager for students and staff to become 21st century learners and users of modern technologies," Chalmers adds. "By connecting and collaborating with the Microsoft Innovative Educator Experts we will be able to empower our students and staff to use technologies effectively and creatively." To be selected, MIE Expert hopefuls underwent a rigorous application process, which included an online application, learning activity and video. They were required to create a learning activity and a two-three minute non-professionally produced video that described their project and how they used technology and innovative teaching practices to impact student outcomes.